One usually associates Cheshire with rolling hills (why do hills always "roll"? ), picturesque villages, and wealthy businessmen seeking a rural lifestyle. Whilst this may be the case, the north of the county is given over to industry and the hub of Britain's motorway infrastructure. Fortunately for the golfer, and wildlife, there are several havens of tranquillity amongst the mayhem. Birchwood Golf Club is one such refuge. To those who are unfamiliar with the area, your first test is to actually find the place amongst a monotonous network of roads and roundabouts. That achieved, you may park your vehicle amongst the various expensive models on display and head for the first tee. Any pent up frustration caused by the lunatic highway design can be relieved on the first. Reach for the driver and give the ball a clout onto the generous fairway, and then enjoy the one and only straightforward hole on this astoundingly tough course. Designed by the Irish architect, T.J. A. Macauley, Birchwood is very much an American style course which makes the most of an abundance of lakes and streams. It therefore pays to bring more than your usual quota of balls, although to suggest that it will gobble up a box-full would be misleading. However, wayward shots will run the risk of a watery grave, so be warned. At 6,754 yards, Birchwood is pretty big by most standards. Much of its length is taken up by several gargantuan par-5's, the longest being the 569 yard 11th. A big-hitter's paradise this may be, but it pays to have brains as well as brawn. On more than one occasion you will need to resist the lure of the driver and opt for something more sparing. Many of the fairways are split by barely visible streams across which even the most mighty of drives is doomed to failure. The aforementioned 11th is one such hole requiring forethought. Named "Valley of Humiliation" - all holes are given titles from Bunyan's "Pilgrim's Progress" - reaching the green in two is only theoretical to we mere mortals. The fairway is split twice by a deep ditch, thereby demanding three shorter drives as opposed to a brace of boomers. The par-4 3rd, "Little Ascent", is similar in this respect - a cautious approach is critical. The par-4 13th, "Riverside Meadow", is yet another hole which urges restraint. This dogleg-right test is the perfect opportunity to exercise "fade" (not "slice"), and for the first time in my life I found that a perfectly straight shot had me in heaps of trouble. Amongst these long holes are a sprinkling of par-3's. The 7th, "A Hill Called Error", is perhaps the most notable by virtue of the steep bank which partially obscures the right-hand side of the green. The adventurous golfer will undoubtedly aim straight for the pin, despite running the risk of trundling away into trouble should a poor strike occur. Those who are more restrained may use the bank as a buffer, the ball rolling sweetly onto the green. However, even this approach requires a good tee shot to avoid the dangers of the copse alongside. The par-3 12th, "Arbour", is perhaps one of the few holes devoid of water. Unfortunately it provides no respite from the rigours of Birchwood, substituting bunkers for ponds. Indeed, what it lacks in length it makes up for with a devilish green; hidden borrows and misleading gradients ensuring that the putter is just as important as any other club. Save for the occasional ditch, the final four holes allow for a slightly easier return to the clubhouse. Sadly, this is little comfort to those of us who have suffered on the previous fourteen, but it does at least ensure that complete disgrace can be avoided. Alas, for those of us with slightly shorter fuses, most of your clubs will have already been broken in despair and the final few having to be played with putter and pitching wedge. Though Birchwood does not have the exquisite surroundings of other Cheshire courses such as Portal, the golfer's only knowledge of his proximity to urban life is the sound of fast moving traffic in the distance. Although little over twenty years old, it is maturing nicely and makes for as pleasant a parkland 18 as I have experienced. Whether you are visiting the county to play a number of its magnificent courses, or seeking time away from business in the nearby cities of Manchester and Liverpool, you would be foolish not to play here. 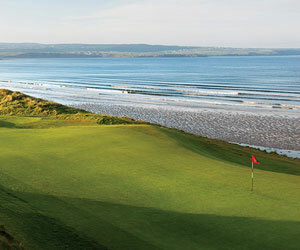 Furthermore, the clubhouse is superb, the facilities extensive, and the members are undeniably friendly. Their "local hero" is none other than Derrick Cooper, the much-respected campaigner who famously led the 1999 British Open at Carnoustie, striking a blow for the more "mature" members of the Professional Tour. Indeed, it is testament to the standard of Birchwood that such a great sportsman proudly associates himself with the club. I truly believe that this course is potentially a venue for future professional competitions. Perhaps one day it will be graced by the likes of Tiger Woods and David Duval, because it certainly deserves to be recognized as the true test of golf it is. Besides, I can think of many more famous courses which have less to offer. Will I go back? Yes, if only to ensure that I meet the challenge a little more knowledgeable than the first time I teed off.... and to make it across those damned ditches! Professionals: Paul McEwen and Derrick Cooper.